How revolutionary were the Bourgeois Revolutions? Author: Neil Davidson ISBN: 9781608460670 Price: £22.99Pages: 840pp. 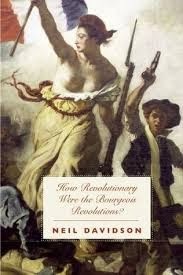 Neil Davidson’s How Revolutionary were the Bourgeois Revolutions is a welcome addition to a slight number of books that deal with the veritable minefield that is the study of these revolutions. Whether you agree or not with his politics or historical partisanship his latest book is hugely impressive but also extremely flawed. The concept of the bourgeois revolution is perhaps one of the most contentious subjects in modern day historiography. For well over thirty years scores of revisionist historians have sought to downplay or even eliminate the fact that these revolutions ever took place. Bourgeois revolution’ is a term that a lot of historians and politicians would like to bury under a lot of dead dogs. In this context, it is to the modern History Today magazine’s credit that its February issue will contain a lead article called Don’t Mention the Civil War. Why is Britain Embarrassed by its Revolutionary Past? One such sceptic is academic researcher Chris Thompson who says “the prolific use of terms like ‘bourgeoisie’, ‘feudal’ and ‘modern’ aristocracy, ‘proletariat’ and ‘non-bourgeois strata of the middle class’ invites comparison with the debates of the Communist Party of Great Britain’s historians’ group in the late-1940s and early-1950s recently edited by David Parker. Antique concepts like the claim that a class of urban capitalists was developing in the sixteenth century with feudalism or that these people were held to be socially inferior and were excluded from power by the Absolute States are given vigorous exercise. ‘Bourgeois’ revolutions inevitably occurred and, in their outcomes, promoted capitalism. There is also an undertow of historiographical controversy: Callinicos’s protest against the revisionist historians of the 1970s is linked to an attack on ‘Political Marxists’ like Robert Brenner and Ellen Meiksins Wood for their assistance in undermining a more authentically Socialist interpretation”. It is perhaps a concession to these historians that Davidson’s book title tilts towards an accommodation with this prevailing view that these revolutions were not that revolutionary. Having said that Neil Davidson’s new book is a significant and welcome contribution to the debate. Davidson is a political historian who incorporates his politics into his historiography. He is a leading member of the Socialist Workers Party which broke from orthodox Marxism in the early 1940’s. Davidson’s Philosophical Conceptions or worldview is molded to a significant degree by the Socialist Workers Party’s troika of theories that were a departure from classical Marxism. The Deflected Permanent Revolution, the Permanent Arms Economy and lastly the theory of State Capitalism. Both the first and the last of these arguments are the most relevant to our subject and Davidson’s adoption of these two principles underpin his understanding of the bourgeois revolutions. The fact that Davidson himself recognizes in his preface when he says that how one defines the bourgeois revolution and capitalism in general defines, you view of the proletarian revolution. In this instance a correct understanding of saying the first proletarian revolution the 1917 Bolshevik revolution is a prerequisite for an understanding of proceeding and contemporary revolutions. Unfortunately, Davidson’s understanding of the 1917 proletarian revolution is not one of an orthodox Marxist. His agreement with the theory of the USSR being State Capitalist has its origins from a one Bruno Rizzi who in his book The Bureaucratization of the World: said “In the USSR, in our view, it is the bureaucrats who are the owners, for it is they who hold power in their hands. It is they who manage the economy, just as was normal with the bourgeoisie. It is they who take the profits, just as do all exploiting classes, who fix wages and prices. I repeat—it is the bureaucrats. The workers count for nothing in the governing of society. What is more, they receive no share in the surplus value… The reality is that common property is not in the hands of the proletariat; but in the hands of a new class: a class which, in the USSR, is already an accomplished fact, whereas in the totalitarian states this class is still in the process of formation” . The Russian Marxist Leon Trotsky who was acutely aware of this belief that the USSR was “state capitalist,” or some other form of exploitative society rejected this theory and did not attach great significance to it. According to David North “In the state capitalist “theory,” the categories of the Marxian political economy were abandoned and replaced with an unscientific descriptive terminology. It was a theory in which the element of economic necessity was replaced entirely with an extreme form of political subjectivism”. Again according to North “at the heart of the Rizzi positions was the repudiation of the Marxist appraisal of the revolutionary role of the working class. To highlight his claim, North quoted Trotsky “All the various types of disillusioned and frightened representatives of pseudo-Marxism proceed… from the assumption that the bankruptcy of the leadership only “reflects” the incapacity of the proletariat to fulfill its revolutionary mission. Not all our opponents express this thought clearly, but all of them—ultra-lefts, centrists, anarchists, not to mention Stalinists and social-democrats—shift the responsibility for the defeats from themselves to the shoulders of the proletariat. None of them indicate under precisely what conditions the proletariat will be capable of accomplishing the socialist overturn. If we grant as true that the cause of the defeats is rooted in the social qualities of the proletariat itself, then the position of modern society will have to be acknowledged as hopeless. How does Davidson’s agreement with the theory of State Capitalism color his attitude towards the bourgeois revolutions. Well a constant theme of his book is the underestimation of the role subjective i.e. political and social consciousness plays in revolutions runs through the entire book. The SWP’ s rejection of the revolutionary nature of the working class which is implicit in the theory of State Capitalism leads them into all sorts of alliances with forces hostile to socialism such the Labour party, trade unions and even the Stalinist of all shapes and sizes. “The theory of bourgeois revolution is not … about the origins and development of capitalism as a socioeconomic system but the removal of backward looking threats to its continued existence and the overthrow of restrictions to its further development. The source of these threats and constraints has, historically, been the pre-capitalist state, whether estates-monarchy, absolutist, or tributary in nature”. “Vulgar thought operates with such concepts as capitalism, morals, freedom, workers’ state, etc. as fixed abstractions, presuming that capitalism is equal to capitalism. Morals are equal to morals, etc. Dialectical thinking analyses all things and phenomena in their continuous change, while determining in the material conditions of those changes that critical limit beyond which ‘A’ ceases to be ‘A,' a workers’ state ceases to be a workers’ state. The fundamental flaw of vulgar thought lies in the fact that it wishes to content itself with motionless imprints of reality which consists of eternal motion. Dialectical thinking gives to concepts, using closer approximations, corrections, concretization, a richness of content and flexibility; I would even say “a succulence” which to a certain extent brings them closer to living phenomena. Not capitalism in general, but a given capitalism at a given stage of development. Not a workers’ state in general, but a given workers’ state in a backward country in an imperialist encirclement, etc. Dialectical thinking is related to vulgar in the same way that a motion picture is related to a still photograph. A classical Marxist view is that social classes are not fixed concepts or as one writer put it “exist in a single, positivist forms across centuries “. The bourgeois has existed in different forms as a class over time and has mutated according to how capitalism itself has developed Davidson’s downplaying the study of socio-economic forces diminishes one's understanding of the development of capitalism and its bourgeois revolutions. While is perfectly natural to concentrate on the main players in the bourgeois revolutions the downplaying of other social and political figures tends to lead Davidson in dismissing elements that made the bourgeois revolution more than just an objective occurrence. As one writer said, “Davidson’s concentration on the analysis of key thinkers as such tends to downplay the extent to which revolution was a social and conceptual reality; that is to say, the analysis tends to emphasize the conservative aspects of leading thinkers’ ideas against the revolutionary context from which they emerged”. Take for instance the English revolution. In the book Milton and The English Revolution, Faber and Faber Christopher Hill makes reference to a ‘third culture’ that was separate from the Royalist and Puritan world views of the seventeenth century. In his The English Bible and the Seventeenth-Century Revolution (London, 1993), pp436-437. He states that “The historian should not stay on the surface of events; his or her interest should not be limited to State Papers, Acts, and Ordinances, decisions of judges and local magistrates... He or she should listen--carefully and critically--to ballads, plays, pamphlets, newspapers, tracts...to every source that can help him or her to get the feel of how people lived and in what ways their sensitivity differed from ours... The historian must listen to alchemists and astrologers no less than to bishops, to demands of London crowds; and he or she must try to understand the motivation of rioters, whether they are labeled anti-Catholic or anti-enclosure rioters or simply food rioters”. A more detailed examination of forces such as the Levellers in the English Revolution, for instance, would have given the book a much more balanced and nuanced understanding of that revolution. In his essay Revolutionary Elements in the History of the English State and Law Evgeny Pashukanis (1927) expands this point up saying “The democratic movement of the Levellers; could be victorious only in connection with a peasant war, i.e. with the same “communist and anarchist” movements whose weakness in England was the fundamental cause of the preservation of all possible feudal remnants. The socio-political ideas of the Levellers by no means were a utopia from the point of view, say, of comparing them with the level of development of productive forces at that time; but they could only serve as the basis of a state and social order beyond the ocean where there was no necessary impediment, where there was no class in whose interest it was to preserve as many feudal privileges as possible. Therefore, the task of actually materialist Marxist research must be to explain by which classes and by which methods the struggle was conducted. Mere references to the inevitable course of historical development are entirely insufficient. Another aspect that colors Davidson’s understanding of the bourgeois revolution is his use of the SWP’s theory of The Deflected Permanent Revolution. The most important aspect of the development of Marx’s concept of permanent revolution was the experience of the 1848 revolutions. Marx correctly stated that the bourgeoisie could not be trusted with the future development of humanity and that responsibility had passed to the revolutionary working class “hence the new era was one of permanent revolution”. For decades Socialists have approached the experiences and lessons of 1848 to understand their own revolutions. The greatest being the theoreticians of the Russian Social Democratic Party. Davidson’s approach as regards the deflected permanent revolution is similar to the State capitalist theory. It is not in the realm of this review to examine the SWP’s approach sufficed to say that again this theory sees the working class reformist and nonrevolutionary. “The theory supplants non-revolutionary petty-bourgeois intellectuals and other bourgeois forces that presided over a “deflected permanent revolution,” consolidating state capitalist formations in one country after another”. In his introduction, Davidson believes that the 1949 Chinese revolution was a bourgeois revolution which led to a state capitalist formation. Again to repeat Davidson’s words “how one defines the bourgeois revolution and capitalism impacts in fundamental ways on how one defines proletarian revolution and socialism”. My biggest problem with the book is that because Davidson is wrong in his analysis of modern-day revolutions how do we trust his evaluation of the Bourgeois revolution. This point aside the book does provide us with a very useful reference point for a study of the bourgeois revolutions. Readers should acquaint themselves with a thorough study of Davidson’s and the SWP’s positions of deflected permanent revolution and state capitalism and their critics within the classical Marxist movement. With these stipulations, I would recommend a wide readership of this book. 1. Bruno Rizzi The Bureaucratization of the World. 5. The ABC of Materialist Dialectics' by Leon Trotsky (December 1939). 2. Discovering the Scottish Revolution, 1692-1746, London: Pluto Press, 2003. 3. The Origins of Scottish Nationhood, London: Pluto Press, 2000.